Note: This shirt will not be shipped. It will be picked up by Cheryl in Atlanta. 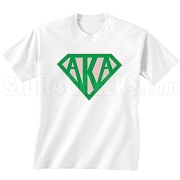 Gray Alpha Kappa Alpha Mu Pi chapter anniversary t-shirt with "35 Years in the Game" within an ivy icon design across the chest and "Fantabulous 54" on the back. This design is embroidered, not screen-printed. The result is a higher-quality garment where the letters are stitched-on (sewn into the garment) and the image will never fade, crack, nor peel. You will earn at least 85 rewards points for this purchase. Your total rewards points will be higher based on the options and quantities that you choose. Your merchandise total at checkout is your true rewards value.